Blog – Adventure #3 – Is that a Snake you’re wearing? When I was still in High School, I volunteered to be the biology lab assistant. Our biology lab was an interactive one and hosted many animals such as a rabbit, cages of white mice, aquariums full of tropical fish, salamanders, mealy worms, and most notably, a cage for a 6 foot long snake. A six foot long Bull Snake to be exact. Bull snakes are members of the constrictor class of snakes and therefore not poisonous. This snake was pretty docile (read: well fed) as far as snakes go, and she would routinely completely ignore me as I lifted the lid of her cage to lift her out and put her in another container while I changed her water source and dumped clean wood chips into one corner of her cage. In reality, I had no idea if she was in fact female, but I nicknamed her Heidi because for the most part she liked to burrow under the wood chips and thus was completely camouflaged and hidden for most of the time. On another biology corollary – stay with me because these two plot lines are going to intersect – one day, I decided to impress a boy who had caught my eye. He was, in my teenaged eyes and opinion, a ruggedly handsome fellow with a bad-boy personality that I found irresistible. I needed something to catch his interest. Something that would make me stand out from the crowd of the much more physically attractive females that flocked around him. And before you judge me, let me point out that this desire to be attractive and noticed is a pre-wired, basic biological reaction in all juveniles of all animal species, humans included, so lacking a pretty plumage or beautiful singing voice, I substituted. My idea: I would “wear” the snake around my waist, and casually walk past the object of my intended affections as he was at his locker which was conveniently situated right outside the door of the biology lab. How cool would that be?? Heidi co-operated and wrapped herself a couple of times around my waist. I think the warmth of my midsection was attractive to her and once in place, she traveled contentedly there without any further movement from her. Thus wrapped and strapped with said fashion accoutrement, I casually strode out into the hallway and past Bad Boy at his locker. Heidi had the intended effect. Bad Boy spun on his heels as I walked past and called out to me. I stopped. I turned. I smiled. He smiled back. We talked. He was visibly impressed. We made plans to meet in the biology lab the next day after classes. Hoo boy! This was gonna be good. As I returned to the lab to continue with my animal caretaker duties, my head was swimming with romantic thoughts. I was daydreaming so hard that lust had made me careless. I was in the mouse room, chopping up cheese and chunks of apples for the mice when a piece of apple shot away across the counter. As I reached out to grab it, there was this blur of movement and color that snaked out (bad pun, I know) across the counter in pursuit of that same piece of apple. It was Heidi! In my mind it happened in slow motion but in reality, it happened in a micro second: I reached toward the piece of apple and she sprang towards it, her mouth unhinging and opening clear back into her body, fangs poised. Although non-poisonous, constrictors of all sorts still come equipped with a set of fangs for capturing and holding their prey while they first constrict and then devour their meal. She and her fangs reached that piece of apple a fraction of a second before my fingers did. It was with shaking hands that I unfurled her from my waist and deposited her back in her own cage. Although I’m pretty sure bull snakes don’t eat apples, I had completely forgotten that I still had her wrapped around my waist there in the mouse room, and as anyone who has ever been close to many mice can attest to, there is a definite STRONG mousey smell around them. The combination of intense mouse odor and the sight of a small object skittering across the counter had activated her hunting reflex. My hand had nearly become her unintended target. 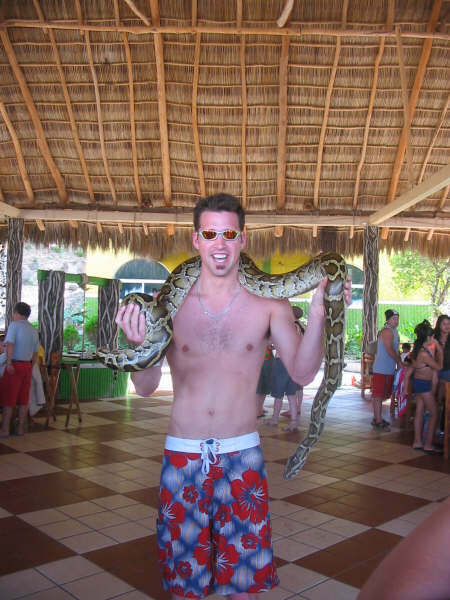 The next day, Bad Boy showed up, but I could not bring myself to handle Heidi, and without my snake fashion statement, my attractiveness was lost upon him. Just as well. Snakes smell, too. There have been a few times, while on holiday with my family, that we have come across photo ops to handle exotic animals. When it comes to having a large constrictor in the picture, I prefer to be the photographer. Oh yeah, and for those of you still reading this far, I used that close-up-and-personal experience of a snake attack in my second novel, DEADLY MISFORTUNE, with the event expanded to be bigger and badder, of course. Curious? 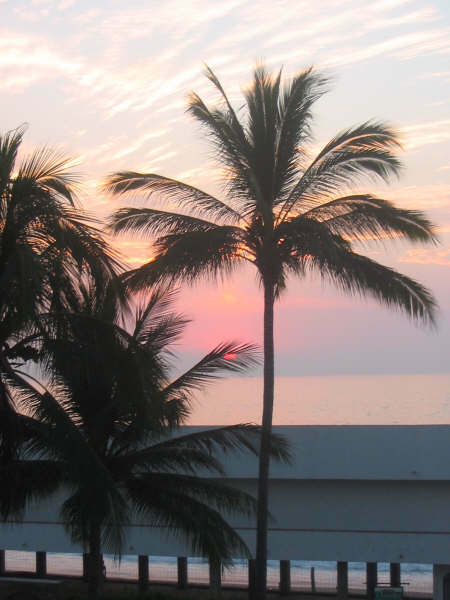 Taking a shortcut and drifting through a Mexican Mangrove-like swamp, the eight of us (yup – same family of mine, that by now you’ve probably come to know reasonably well), were boating over to a neighboring beach, the sun splashing down on our shoulders like warmed suntan oil. It was early December – shoulder season meant no crowds – and it was blissfully perfect. Arriving at our destination, we were delighted to see that, except for a half dozen fishermen who were working their fishnets in the shallow waters, we were the only ones on the beach. There weren’t even any customers lounging on the patio of the tiny traditional Mexican restaurant that sat just back of the soft strip of sand that rimmed this little bay. As we strode into the warm waters, the fisherman yelled and greeted us in Spanish, waving their arms in an enthusiastic fashion. 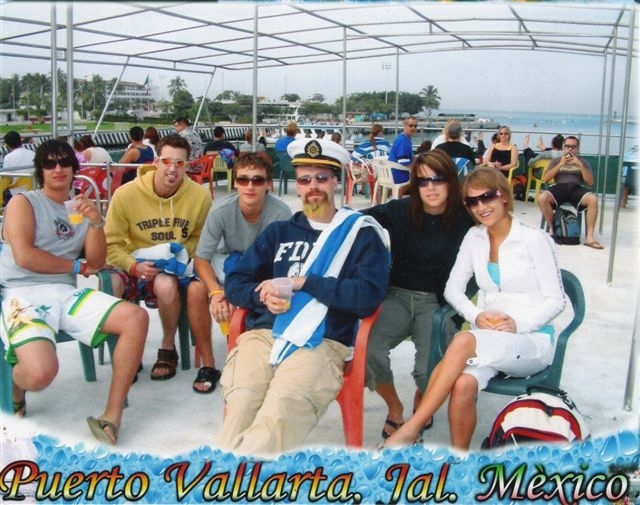 Speaking no Spanish, we grinned, waved back and plunged into the waves. Within seconds, the entire underside of my body exploded in pain, feeling akin to what I imagine it would be like to have five thousand elastic bands all snapping against my skin at one time. Staggering from the water, I was nearly stampeded and pummeled into the sand by the rush of all other family members in their efforts to clear the water as well. Our combined screeching, however, was topped by the shrieks of my 14 year old daughter. A raised crimson welt slashed down the length of her thigh. Something had stung us all, but only she had any mark to prove it. Somewhere in my panicked brain, my EMT training took over. A thought rose to the forefront. A very logical, extremely scientific thought. Something about either vinegar or concentrated urine salts changing the ph or cellular barrier of the ocean dweller’s venom-filled cells to stop or reverse the expulsion of the venom out of the deposited cellular cysts. So I did what any scientist would do. Well, I can tell you that I got no co-operation from either side. By now the fishermen had hustled over to us and had already enlisted the assistance of the senora, owner of the beachside restaurant. This angel flew to our rescue with a huge bowl of sliced up limes and began to squish vast amounts of lime juice all over the welt. Plenty of it. And it seemed to work. Within minutes, my daughter’s wails had downgraded to a few shuddering sniffles. “Why you no listen, Senora?” the puzzled fisherman asked. “Listen to what?” I asked, slightly annoyed to being grilled like this while the lime juice application was continuing. This woman was using copious amounts. Peligro. Danger. That much Spanish I knew. But what kind of danger? My confused look brought only a snort from him, and he grabbed a glass from his satchel, strode into the ocean and scooped it full of water. “Medusas!” he exclaimed upon returning, and he held the glass up for me to see. I squinted and then I gasped. Suspended in the water-filled glass were several tiny almost transparent Jellyfish! The “friendly” hand waving and shouts from the fishermen had been words of warning to the crazy Canadians who were blindly romping into the infested waters. We later heard from another bilingual tourist that there had been some kind of overnight underwater storm that had stirred up and brought into the shallow waters, a bloom of – given the size in the glass sample – baby jellyfish. Oh yeah, and one humongous one, as my daughter would have you believe. Later that evening, as the sun set over that expanse of mysterious ocean, I made a journal entry of our day’s adventure, filing it under “Quintspinner Research”. It was shortly after that, that I got around to treating my still-slightly-burning skin with a lime juice/tequila concoction of my own. Taken internally. And plenty of it. Now go and see where in Quintspinner – A Pirate’s Quest, part of this little true story was adapted to fit into the plot. I’ll give you a hint. It involves the character, Mr. Lancaster. He was fond of liquid medications taken internally. Believed they did more good that way…. For those of you needing to acquire your own copy of the Quintspinner adventure to find the answer, you can net one right here: http://amzn.to/1kLuqi9 . And stay tuned for the next adventure installment: Um … is that a snake you’re wearing? Hiya! Those of you who follow me on Facebook, Twitter, here on this blog, or who have read my novels in my Quintspinner series (you’re my – ahem – favorites by the way) will know that the series is set in the historical setting of the West Indies of the early 1700’s. 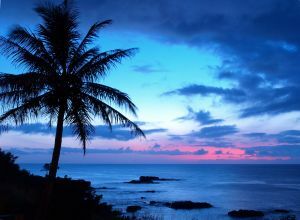 Tropical sunset – Romance at its best. All of those things that bring to mind to romance and excitement of Pirates of the Caribbean or of the old Errol Flynn movies. When I considered writing the series, that’s about all that I had in mind. I didn’t realize that the historical genre is considered by many in the writing sphere to be one of the hardest genres to write in, as it requires not only a great story and captivating characters, but also an accurate portrayal of life in the time era in which the writer has chosen to set his/her story. And what did a prairie girl like me know about sailing the seven seas? Well mostly that I liked being on the water and that I wasn’t particularly prone to sea sickness. However, it did soon occur to me that I had had more than just a few real-life adventures of my own to draw from, and since I am frequently asked about such events, I’m going to share these stories in a mini-series right here! 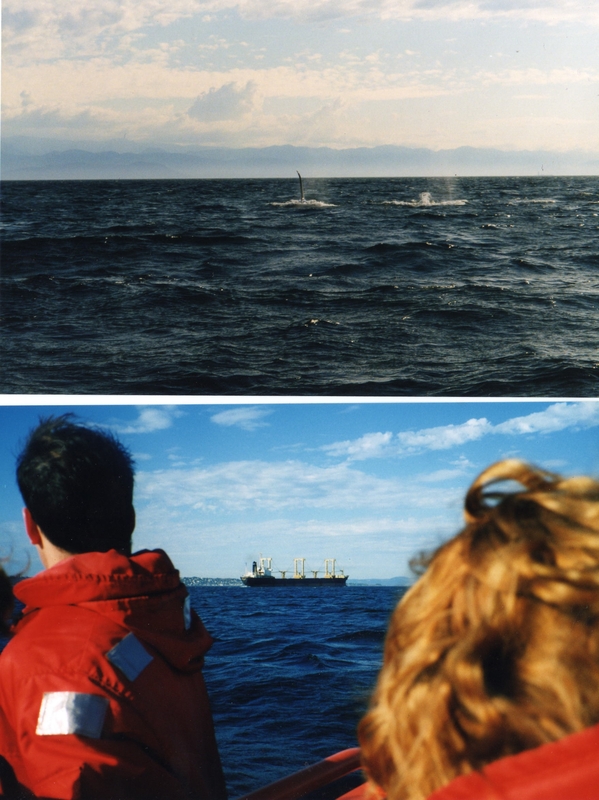 “Whale Watching off the Sunny Coast of Vancouver Island” the glossy brochure proclaimed. I thought that sounded like the perfect blend of holiday and excitement, and of course, it promised to provide the mandatory (in my mind) educational component. Our family of eight and a friend of my stepson’s were all going to be on Vancouver Island for a week in July, and I was looking for quality ways to spend our time there. “Quality,” in my mind, meant something new and different, usually something that the kids would never have done on their own. Whale watching from a dinghy seemed to fit the bill. Pods of Orcas, commonly known as “Killer whales,” swam around the tip of Vancouver Island, a few miles off shore, every summer, and enterprising sailors turned the opportunity into a summer tourist bonanza. Pictures in the brochure showed a boat tethered at the pier, full of smiling people looking up at the camera — it certainly was no action shot, but it was something that all of us could do together, given that there was a wide range in the children’s age from eight to sixteen. “Yeah, but there’s no guarantee we’ll even see any,” my son pointed out, “It says so in this stupid pamphlet right here.” And he stabbed his finger at it. “If nothing else, time together in this small, smelly boat will allow all of us to bond, my darlings,” I replied with a tight smile, hoping that the look in my eyes would tell them that the discussion had ended. At the dock, the oversized Zodiac raft looked safe enough. It was no more than a glorified dinghy with a couple of small motors attached to the back and four wooden seats spanning its width. We were fitted with bright orange full-body life preserver suits by the “captain” and his helper. The family gathered to embark on Whale Watching. The body language just screams “excitement”, doesn’t it? “Phew!” my daughter gasped, “These smell worse than the boat, and they are way too hot!” She pulled hers off her shoulders and peeled it down to her waist. “No one goes,” the captain bellowed, “until everyone has their suits on, right up to the last snap and zipper!” My daughter reluctantly pulled hers up again. “Thank God, no one will see us in these things,” my stepdaughter, pouted. 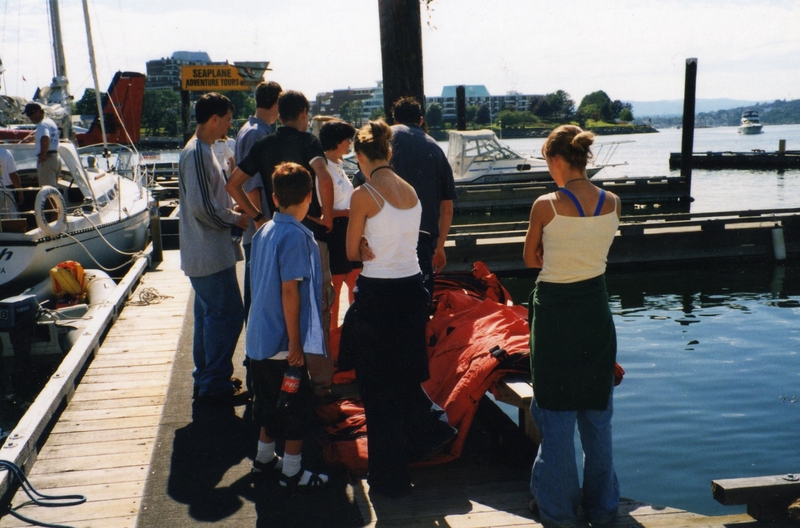 This “Whale Watching” expedition was quickly turning into a teenager’s nightmare – being forced to wear really uncool clothes, having a crabby guy in charge who yelled at them, and having absolutely nothing to do but sit still, crammed together shoulder to shoulder while listening to him for the next two hours. The nine of us, as well as three strangers, climbed into the boat, all decked out in the snazzy, tangerine full-body life preserver suits. We joked about being “astronauts” and “Pillsbury Dough boys in Hallowe’en costumes,” and the boys jostled for the outside seats on the benches. Outside the harbour, the captain opened up the motors and we tore into the ocean waves, all of us bouncing wildly about in the boat. This part of the ride was exhilarating enough that even my teenagers, who were usually too “cool” to get excited about much, hung on for dear life. We were about a half an hour into our boat ride, with the shoreline having disappeared from sight, when our captain yelled, “There they are!” He pointed to the ocean horizon where we could just make out several spouting geysers amid tiny points of black dorsal fins. He carefully maneuvered our boat through the four-foot waves, to a spot just ahead of the traveling pod and then killed the motor. He explained that it was provincial law that boats had to maintain a certain distance from all known marine life when their motors were running. Sitting with “dead” motors allowed us to be legally closer to the whales. Even the boys were paying attention now. One Orca surfaced about 20 feet from our boat, spouted and dove. Everyone in the boat cheered with excitement. Even from 20 feet away the Orcas looked enormous. It dawned on me that Orcas were fierce carnivorous predators, known to hunt in packs, and here we were, sitting a mere two and a half feet above the ocean’s surface in an inflatable boat! Without warning, our boat shuddered and the starboard side shot out of the water. Grabbing the seats to keep ourselves from sliding sideways, we screamed as a mountainous wall of glistening black dorsal fin rose out of the water, tilting our boat and pushing the starboard side even higher. One second later, a waterfall of freezing ocean water crashed down upon us, nearly swamping our boat, as the huge Orca spouted and then dove under the boat, bumping it again as it passed beneath. “BAIL! For God’s sake, BAIL!” the captain roared at us, and we desperately grabbed for the plastic containers tied to the seats. Ocean water sloshed up to our knees. The captain started the motors and we bailed as fast as we could. He steered the boat back in the direction that we had come from and we roared away from the spot. We were all still shaking from the adrenaline rush when, a few moments later, the motors whined, sputtered, and died. “Oh no! We’ve sucked in kelp! The motors are plugged!” the captain yelled. He radioed our position to the coast guard while we continued to madly bail out the boat. Drenched as we were, and in the ocean wind, our hands soon cooled to the point that it was difficult to hold onto the bailing containers. The orange suits that we had earlier joked about were now conserving our body temperatures, as we sat huddled together, awaiting rescue. As we veered towards its edge, a seeming miracle happened: one motor sputtered back to life. Ever so slowly, we made our way around the rocky crag and back towards the shore. An hour later, we spilled from the Zodiac and onto firm dry land, our eyes stinging and our faces coated white from the ocean salt. Back at their office, as we wearily hung up our orange suits, I noticed their motto printed in large black letters on a wall poster. It said, “Our Adventure Tours – More Than You Could Ever Hope For!” No kidding. G’wan. You know you wanna’. It helps me fund my next fishing trip. Thanks for reading.